We already broke the mold for the stereotypical IT tech. We realize that great communication is the only way to solve your problems. And the best way to effectively communicate is to be personable. We pride ourselves on being approachable and personable first, technical second. Sure, the nerdy IT guy your company currently uses might be able to fix your problem, but he's awkward and will make you listen to endless stories about video games while he works on your computer. We're different. We listen and our clients like us because we're easy to talk to. This helps us to get your problem fixed more quickly, so that you can get back to work. Nathan Phillips is the owner of Phoenix IT and has been the captain of the ship for over 15 years. He has a deep knowledge of the technical stuff, but has an even deeper knowledge of customer relations. He prides himself on not only being the guy who can fix your stuff, but on being the guy who wants to help your IT systems become the most productive tool in your business' toolbox. Nathan plays guitar in his spare time whenever he's not serving as a wrestling opponent for his 2 year old. Randy coordinates all of our technical operations including everything from client support to big facility network design and build-out. With over 15 years of field experience, he knows what works and what doesn't and will be glad to share his hard earned knowledge for the benefit of your business. Randy serves as the senior technical support unit for our team, but also loves to get his hands dirty working on problems in the field. His research and knowledge of new technologies always amazes the rest of us in the office. Randy plays drums and has endless knowledge about Family Guy. 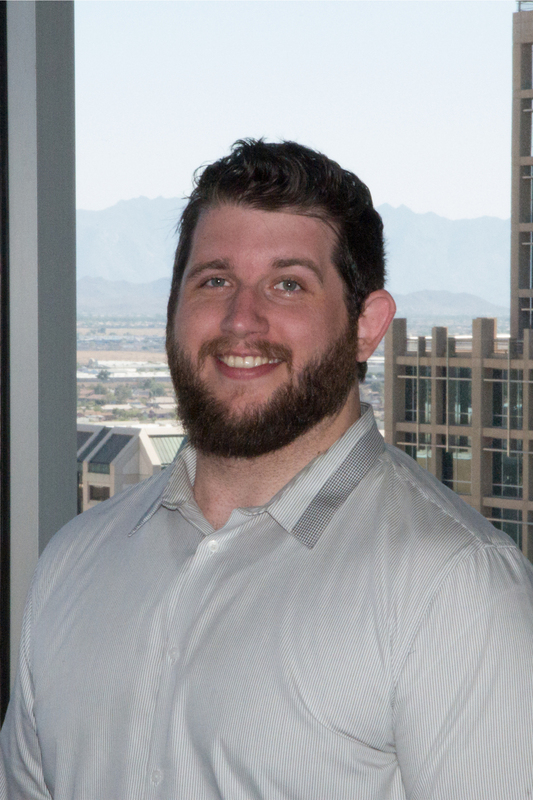 Jake came over to phx-IT from the fast-paced world of logistics with a deep understanding of customer satisfaction. He is super personable and we brought him on so that he could showcase his talents to our present and future customers. His time in the US Army taught him a thing or two about commitment and he’s brought that commitment with him to serve our customers. Jake’s main focus is helping our new clients seamlessly transition over to our service model so that we can eliminate their IT problems. He also likes finding new clients who would like to use a more efficient IT service model to help propel their business forward towards success. He will ensure that your needs are met and that you are completely satisfied with your service. In his spare time, Jake performs around the Valley as a stand-up comedian and enjoys spending time at the gym pretending that one day he’ll look like Arnold Schwarzenegger. Josh has a real passion for taking on challenges and making customers happy. His background in the tech field as both an IT trainer and customer service manager have helped him build a wide base of knowledge for all things computer related. This knowledge combined with his dedication to making sure all client systems are running optimally, make Josh a favorite with his clients. I have to warn you though, his enthusiasm and positive attitude are contagious. When Josh isn’t knee deep solving the world’s computer problems, he can be found cruising the neighborhood on his vintage Schwinn bicycle on the way to tear up some delicious tacos at his favorite spot. During is down time he enjoys DJ’ing events, producing and doing voice overs for commercials, and you can listen to him entertain you over the radio on the weekends, that’s if he isn’t being attacked by his 6 fur children! Coming from a background of audio engineering and customer success; Kyle brings unique blend of technical know-how and customer service experience to each of his clients. He enjoys taking on new challenges and absorbing new education and techniques, to further his growth in the computer & technology field. Outside of work Kyle keeps pretty busy with his various hobbies including woodworking, playing bass guitar and watching movies; the latter of which you can catch him talking about on his weekly podcast. Steven came to phx-IT with a background of excellent customer service and technical ability. With his 10+ years experience, he leaves behind a wake of positive culture wherever he goes. Steven insures all his clients' IT needs are met in an urgent manner and puts customer satisfaction above all else. He is enthusiastic about the newest trends in technology and sharing his latest find. Each day presents new challenges in the tech-field which he enjoys and excels at solving. Steven can often be found at home implementing the latest and greatest tech. When he's not tinkering with his home systems, two rambunctious boys keep him and his wife on their toes while going on weekend adventures.